Revised rendering of Bart Blatstein's proposed mixed-use project at Broad Street and Washington Avenue in South Philadelphia. Developer Bart Blatstein, who has led much of the development in Northern Liberties and other neighborhoods as the CEO of Tower Investments, is the official new owner of a lot at South Broad and Washington streets after years of community debate, zoning restrictions, and, most recently, a lawsuit. He plans a 32-story tower there. The property, 1001 S. Broad Street, will be a mixed-use development. The Philadelphia Business Journal reported that Blatstein went up against the lot’s former owner, NH Philadelphia Properties, in a lawsuit after Blatstein had started design and zoning approvals before actually owning the site on the northeast corner of the intersection. Report: Philly ranks as one of the worst places for renters in the U.S.
Development plans for the lot include 1,000 new apartments and 160,000 square feet of retail space, as well as parking for up to 600 cars. 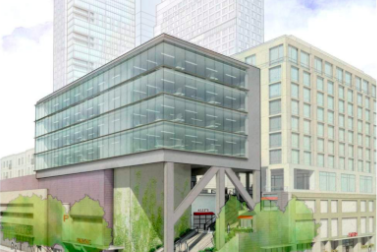 Zoning approvals weren’t easy to come by for Blatstein, however; the development project has drawn ire and some controversy amid a bid for approvals. Earlier this year Blatstein had to seek two special approvals to build the number of apartments desired, as well as his vision for roof-area retail space. Since news broke that Blatstein planned to purchase the lot, dating back to late 2013, his plans have undergone some adjustments after the backlash. His initial plan called for two 32-story towers. The timeline for the development is not outlined.